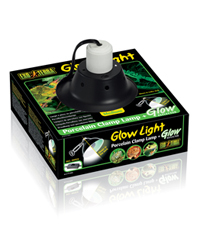 The Exo Terra Glow Light gives you the versatility of placing heat and/or light sources on your terrarium where needed. The device is sturdily constructed, with a metal reflector, heat resistant ceramic socket, and a spring-loaded swivel clamp. It can be easily turned off and on by the switch, mounted on the extra long power cord. The inside of the reflector is coated with a highly reflective luminous coating that continues to glow long after the lamp is turned off. This allows diurnal reptiles and amphibians to retreat in their night burrow or hiding without stress. A moon-like glow enables nocturnal reptiles and amphibians to see properly without disturbing their night cycle. It is also ideal to monitor your animals during night time, without switching on the lights which can cause stress and disorientation. The coating reflects the otherwise wasted light rays and stores the light energy during daytime and slowly releases it at night, which makes this fixture more energy efficient then conventional fixtures. No need to add an additional night bulb, unless used as a heating source. Available in 3 sizes: 14cm, 21cm, 25cm. This clamp lamp is ideal for my turtles basking area. It has a good sturdy clamp which is suitable to clip to a variety of tank sizes and is very easy to get to the desired angle. It also contains a clip to suspend from a separately purchased lamp stand which I have not used. The glow gives a short period of fluorescence but isn't necessary for a turtle. I have purchased a larger version to use for UV lighting to give a wider coverage, but this size is ideal for basking. Exo terra are always a good, trusty brand.